You are here: Home > Have You Ever Seen The Rain? 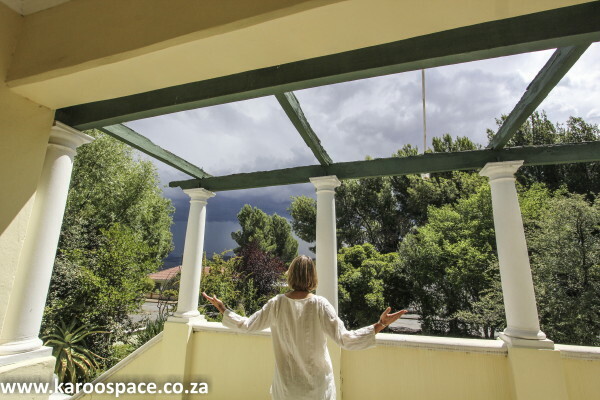 Julie welcoming the Christmas rains to Cradock. People who live in the desert love rain. They love it in ways city people don’t understand. And here, in the December season of 2017, there are reports of widespread rain all over the Karoo. This is the best Christmas present we could ever get. It came in the night and it fell gently, insistently. 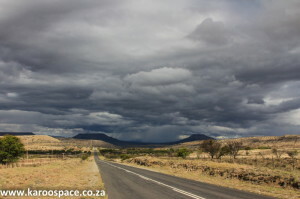 In the Karoo and the Kalahari, the horizons are so wide you can see the weather coming while it is still hours away. You can see clouds coalesce and darken over the mountains, then advance, walking on legs of rain and lightning. Rain slicks the streets in Beaufort West. When it rains in the desert, people switch off their televisions and radios to listen to it falling. They revel in the drumroll on tin roofs. They leave their windows and doors open so they can smell that delicious rain-on-earth fragrance. They’ll stand at the windows and watch it bucketing down. They’ll wake up in the night to listen to it. Some will even dab a bit of wet clay on their tongues to taste it. Farmers cannot resist venturing out to see how their lands look, newly wet. It inevitably ends with a comedy of bakkies getting stuck in the slick mud, and tractors being started up to pull them out. 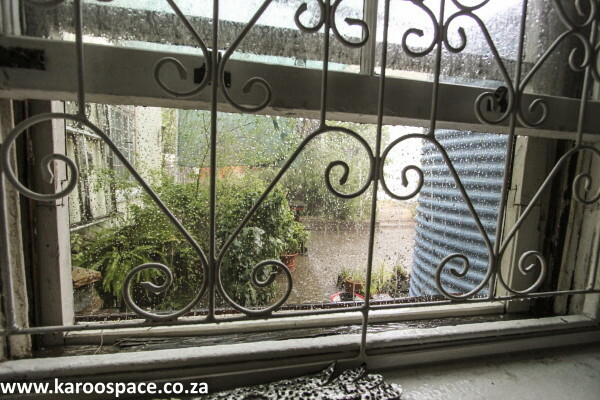 Rain can bucket down on one Karoo farm, and skip another. 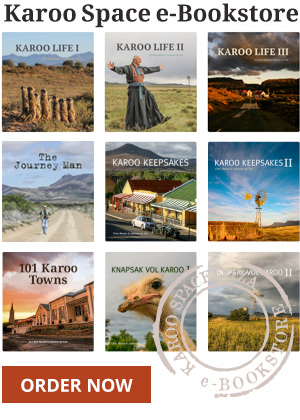 The day after the rains, the first subject of conversation in town is invariably how much has fallen and where, because in the Karoo, one area can remain practically dry while another one experiences a cloudburst. Here, rain is still measured in inches and points. Only the younger generation use metric measurements. When boreholes are drilled, there are celebrations when water is reached, especially out in the dry northern Kalahari. The water is tasted and ‘baptised’. Someone is inevitably thrown into the mud. 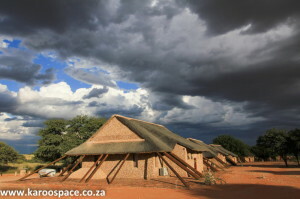 A dramatic Kalahari storm gathers strength. In the western and northern parts of the Karoo, brackish water is common, and people get so used to the salt that if they move away, they’ll add a pinch of salt to their coffee. Beaufort West regularly suffers from droughts. When their dam dried up, the Gift of the Givers came to the rescue and motorists were urged to drop off bottled water. Singer and Karoo herbalist Antoinette Pienaar says half the townspeople were visiting the churches to pray for rain and the other half were “in the klowe, pleading with the Watersnake”. One of them worked, because in February 2011, the flash floods filled up the dam. In 2017 the drought returned, and the Central Karoo plunged into crisis. The recent rains have been patchy and the drought is far from being broken. 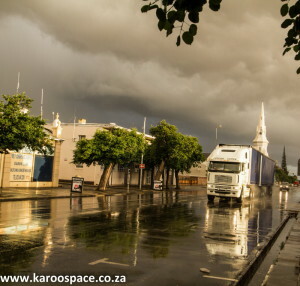 But the thunder echoing over the ironstone koppies is music, and the scent rising from the wet Karoo earth is perfume. There is hope at last. And here it comes. Scenes from a bedroom window. 2 Responses to Have You Ever Seen The Rain? Great pics and read you two. What a beautiful and poignant article – puts things into perspective very nicely, and really makes us realize what the most important issues and risks of fracking are. NO to fracking! !